For many years, Sharon has been a certified professional life & wellness coach, as well as consultant for individuals, families, groups, organizations, and businesses. 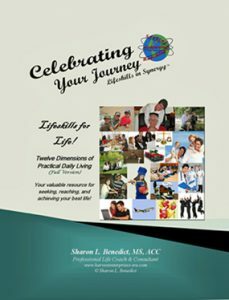 Her life’s work is reflected in her book, Celebrating Your Journey, Lifeskills in Synergy. available for purchase at most all online booksellers. ICF offer credentialing programs for coaches-in-training. ICF is advancing the coaching profession to become an integral part of society. Their members lead this journey by representing the highest quality in professional coaching in many fields, businesses, organizations, industries, and individual lives. There are a myriad of reasons why a person chooses to utilize the skills of a coach. Although coaching addresses the whole life of a client, you are the one who chooses the purpose and goals of the coaching relationship. There are others who particularly want to have support and accountability toward achieving specific projects as part of their life design, both professionally and personally . . . whether the goal is relationships, time management, career, money management, or wellness. To find out if you are ready to be coached, take a moment and complete the form provided below. Your responses will give you a clear view of your readiness. May your life be made richer and more vibrant through the expert advocacy of a professional life coach. Feel free to take advantage of Sharon’s resources, Tips for Life, and life experiences as a speaker for your group, or a writing project. You may contact Sharon for coach referrals with one of her colleagues; or find out if Sharon may be available herself upon referral. Start Transforming and Celebrating Your Journey today!